Fahrenheit 32 is the creation of Hedi Slimane (Christian Dior's former artistic director), perfumer Louise Turner, and François Demachy, current director of perfume development at Louis Vuitton Moet Hennessy. Fahrenheit 32 is described as a “fresh oriental” and its main ingredients are orange blossom, vetiver and vanilla — with added “fresh notes,” a “solar note” and aldehydes. The only similarity between “original” Fahrenheit and Fahrenheit 32 is the shape of their bottles, so judge Fahrenheit 32 on its own merits. If Fahrenheit was about ‘heat’, Fahrenheit 32, with its name (the temperature at which water freezes), packaging (frosty white and metallic) and advertisements (featuring high altitudes) seems to proclaim its “coolness” — while using rather “warm” ingredients. Fahrenheit 32 stays close to the body, zips thru its stages of development quickly, and then disappears within 90 minutes. Fahrenheit 32 is one confused fragrance. Does it want to be “fresh” and clear…or “oriental”, sweet and powdery? Does Fahrenheit 32 want to be “cool”… or “warm?” Fahrenheit 32 seems unfinished to me — a scent in which ‘conflicting” accords never meld successfully. Though some believe Fahrenheit 32 is ‘feminine,’ I don’t find it girly or womanly at all, but it’s not really masculine either (in the traditional sense); it’s just (again) confused. Like me! I neither love nor hate Fahrenheit 32 — I don’t like it either but I don’t dislike it. It just leaves me cold, or should I say lukewarm...? Christian Dior Fahrenheit 32 is available in 50 and 100 ml Eau de Toilette and in matching grooming products. 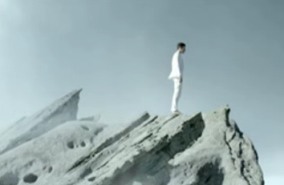 Note: image is a still from the television ad for Dior's Fahrenheit 32, which you can see here. “Perfume development at Louis Vuitton Moet Hennessy” sounds almost like an oxymoron. *grumble grumble* So it is not at all in any remote way like Fahrenheit? Have you ever tried Fahrenheit Summer? I wonder what that one is like. Nope, not like Fahrenheit AT ALL. This is the first Fahrenheit flanker I've tried. I wish they'd just release the top notes of originalFahrenheit for summer…all that great honeysuckle, bergamot…even if it disappeared quickly. I never can understand why they have flankers which bear no resemblance to the scent of the original. Fahrenheit was pure deliciousness. This sounds like a yawn. “Lightly spiced melon in the sky” is a *brilliant* description, but not one that has me tripping over myself to race to my car and burn rubber as I tear out of the driveway in order to pick it up at the nearest mall. “Confused” and “unfinished” aptly describe my feelings about F32, too. It isn't a bad fragrance but there is nothing about it that grabs me, you know? And there's something about the vanilla used in F32: it's either too sweet or too synth, in any case, it somehow does not complement the rest of the scent. I'll take Fleur du Male over F32 anyday. Hmmmm… lukewarm… then it should've been named Fahrenheit 88, instead of 32! I was hoping someone (you know who you are….) would write in who liked it, but I guess they will remain silent! Okay, then. I liked it. I reviewed it on my blog last week–click my name to read it–and thought it was strange yet wearable. (I haven't tried Fleurs du Male yet; it's not available here, so an orange-blossom scent for men is still a novelty in this part of the universe.) It's extremely simple but not boring, I keep sniffing myself when I'm wearing it (always a good sign), and I'll probably buy a bottle of it sooner or later. I have both, although FdM is a much better *novelty* for me. I've realized that orange blossom kicks my gears up a notch—defintely a feel-good note. Yeah, it does have that lightly spiced melon feeling at the beginning, then moves into a warm sweet and powdery leather-fougere accord, then comes the sweet vetiver on the drydown, like an intense SMN Eva. Overall, there's a cooling-off effect of F.32, like warm rock croppings after a sunset with the warmth slowly and languidly dissipating and then finally smelling the green coolness of grass. Peaceful, kinda solitary and a bit brooding. I say, keep 'em coming with the florals, it's a step in the right direction. Those fruit-coffee-woody-green stuff like Polo Double Black was starting to bug me. It was confusing, clueless, rather brash, with a “what can we quickly do next” feel. I wonder who's stepping up to the plate with their floral interpretation? I forgot to add…F.32–freezing? No, I don't think so 70 degrees, perhaps. iMav: it sounds like F32 was developed for YOUR skin! Unfortunately I didn't get any leather whatsoever, no “green” notes and the vetiver “wilted” on contact. As for florals: men have had a rose spree, now an orange blossom “revival”…I'm hoping for a jasmine or even power-house lotus in a men's scent. The scent was definitely complex on me, the transition into each accord is unbelievable. Gosh, could it be so different for everybody? Fresh created three scents called Hombre de Flores Jasminium, Narcissus, and Polianthes Tuberosa *drool*…now discontinued, I can't get ahold of any of them. I just checked eBay and they had the Tuberosa scent available for roughly $20 from the UK, but I'm not trusting the seller–52 negatives within the past month…ermm, NOT good. If anyone finds a place online, please be nice and let me know *sob!*. Loved your comment on both Farenheits. You seem to be, IMHO, right on target. The original's “tar” note you describe is what most people describe as the “petrol” note, and it makes that fragrance a high bid bet, as it may or may not turn into magic depending on your skin's chemistry. Great reviews as always and truly loved the associations of earth and chaparral on the original and this one's melon-in-the-sky, wich is a note that sadly does not last on my skin! Seattle! I listen to a podcast from that city, is called Dvdweekly podcast, very funny. The melon notes..mmm remember Burberry Weekend? well, that is a typical melon note that goes paper-sour (that is the only way I can find to describe it) on me. I get warmth from F32, perhaps weirdly. I think I like it, but also vascillate on that. I also have and enjoy the original and just picked up Fahrenheit Summer in the winter sales. I prefer the Summer edition, though it's very close to the original in its composition, albeit a bit less dense or “fresher”, as per its title, which makes it a little more wearable. JA: I think all the Fahrenheit flankers come and go before I have a chance to sniff them…there are so many! I really loved the original. This one is interesting. I love this cool warmth, or warm coolness. It has a bit of an ethereal-ness. (your melon in the sky, but it turns to icyness in a warm sky on my skin). The melon is only a flash for me, and then takes on a lovely turn. I like it. This is the 3rd of 4th trial run I have given it. And I think it earns a full bottle. I don't find it a miss at on with my chemistry. I at least think this one is worth a try. I think the confusion is part of the charm. At least it is risky and not boring mainstream. Those are the real yawns. If you're still interested, I just found this on ebay as I always search Fresh fragrances. Someone has listed the Narcissus scent and they have 100% feedback so it is probably worth a try. It sounds intriguing to me, but I don't know if I want to put down the money for something I've never sampled. Though it is very rare and tempting! It smells nice. Not to sweet and not to fresh, but there is something in it that makes me sick… I can't wear it. Fleur du Male is better. Well i went to Macys today w/ my mom to find my bros a cologne for their bdays and i got one down. My bro, who loves allure homme sport told my mom he wanted something kinda sweet so after smelling armani attitude extreme(i really liked it), ysls new one(this one too), armani diamonds(and this one), beckham story(and this one), infusion d homme(love love love love love it), desiel only the brave(also liked), Givenchy play and intense(you know) and fahrenheit 32, my mom had the final say and she chose this one. Its nice and i like it. I think my bro will enjoy it! I much prefer it over his Allure Homme Sport! Thats for sure! Well C! is this the white bottle ? I got my Dad the 100ml for Christmas, yea he likes it. he never “loves” any scent you get him, he’s so fickle with perfume. he’s never stuck to one scent.